A versatile tour that leaves nothing to be desired! We will go riding in our home-region between the Highlands and the Coast, along fine bridle paths, off the beaten tourist tracks. We start the adventure with rides in our region – along the river Miðfjarðaá and over pathless mountains, where our horses get to show their willingness and surefootedness! 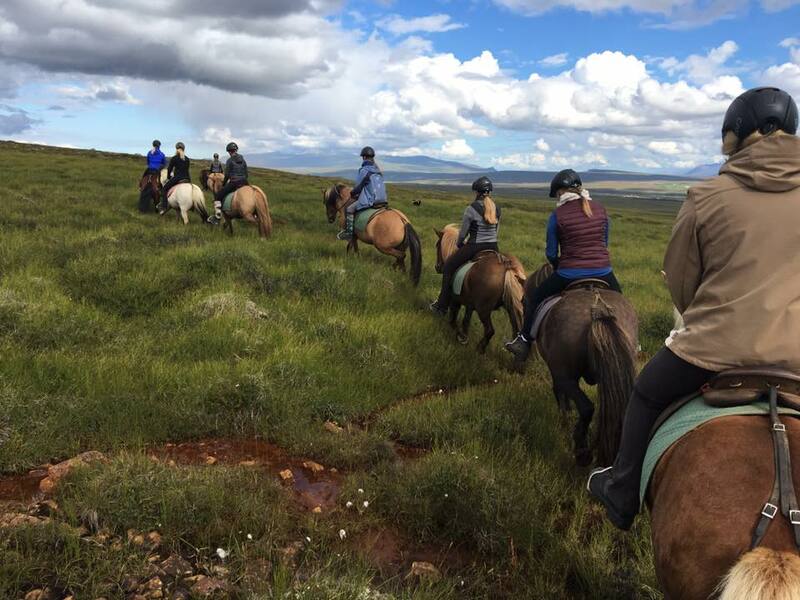 The highlight of our trip is a riding tour to the fjord Miðfjörður, where – in true icelandic spirit – a herd of free running horses accompanies us. Apart from discovering Iceland on horseback, you also get to enjoy the beautiful nature in West-Iceland on excursions with a minibus. Visit beautiful places such as the peninsula Vatnsnes with Iceland’s biggest seal colony and the unique basalt formation Hvítserkur, the woodland Húsafell, Europe’s biggest hot spring Delidartunguhver, the magical Waterfall Hraunfossar and the Lava Cave Surtshellir. Reception at the airport in Keflavík between 15:00 and 16:30 or pick-up in Reykjavík around 17:30. Transfer to the farm Brekkulækur in the north of Iceland (3,5 h), where we will stay for the next 4 days, and dinner there. In the morning, we will go for a social walk: Insight into the flora, fauna and life in the icelandic countryside. After a lunch break, we will meet the horses, go for a long ride through our beautiful river valley and get acquainted with them and the riding style. After breakfast, we are getting ready to explore the area in horseback. We will either ride to the farm Huppahlíð., where our path takes us over uneven ground and in direction of the highland. There, we get to know our neighbour Helgi who will show us his workshop on the farm. Or we will ride on soft paths along and across the river to farm Urriðá. A typical icelandic coffee invitation awaits us there and the possibility to look at handknitted woolens by the young farmer. Later, we will relax in the natural hot water swimming pool in the little village Hvammstangi. Today, things get truly exciting! 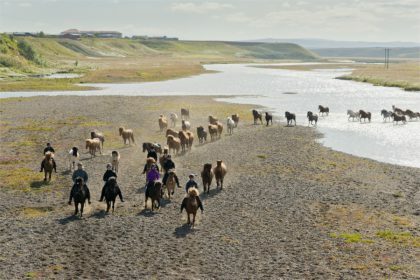 We will start our adventure with the free running horses, while we ride on beautiful soft paths along and through the river Miðfjarðará to the Fjord Miðfjörður. There, the horses will spend the night, while we soak again in the local swimming pool. We will start the day with an excursion to the beautiful peninsula Vatnsnes, where Iceland’s biggest seal colony and more scenic beauties await us. After lunch, we ride back from Miðfjörður with the herd of free running horse to the farm Brekkulækur, where we will have to say good-bye to the horses. Today is an excursion-day and we are driving to Borgarfjörður, where we will marvel at the world-biggest hot spring Deildartunguhver and explore Iceland’s biggest lava cave “Surtshellir”. Overnight stay in a charming simple country hotel. After breakfast, we visit the impressive waterfall Barnafoss and the enchanting headwaters area Hraunfossar. Afterwards, we drive onwards to Reykjavík, where you will have time for shopping and exploring the capital of Iceland. For guests who have booked 6 nights, drop off will be in Reykjavík. Guests who have booked 7 nights will be transferred to the guesthouse in Keflavík around 19:00. Transfer to the airport, good bye to Iceland and flight home. Full board starting with dinner on day 1, ending with breakfast on day 7.